Pomegranates are in season through winter! 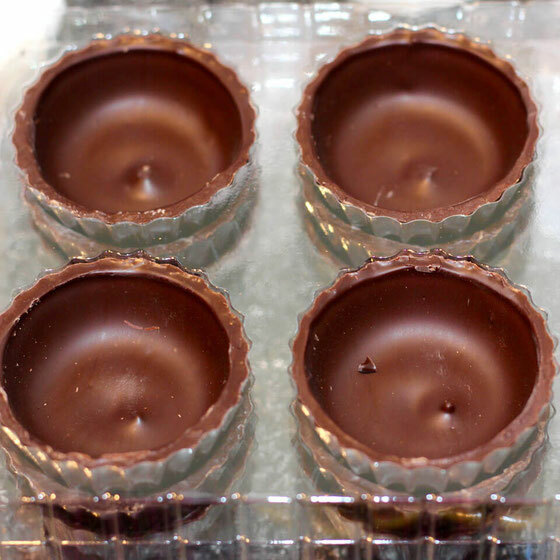 Enjoy their delightful crunch in these mini chocolate dessert cups. I'll first start by talking about the inspiration for this recipe. It all started with these adorable little dark chocolate dessert cups, which my boyfriend, Lawrence, and I spotted while in line to check out at Sam's Club. Everyone knows that items are positioned by cash registers so you'll impulse buy. Well, impulse buy, we did! These chocolate cups are made by ChocoMaker. We brought these dessert cups home with us, and I couldn't wait even a day before playing around with them in the kitchen. It also happened to be the very beginning of pomegranate season, so I had a fridge full of pomegranate arils. Ta-dah! 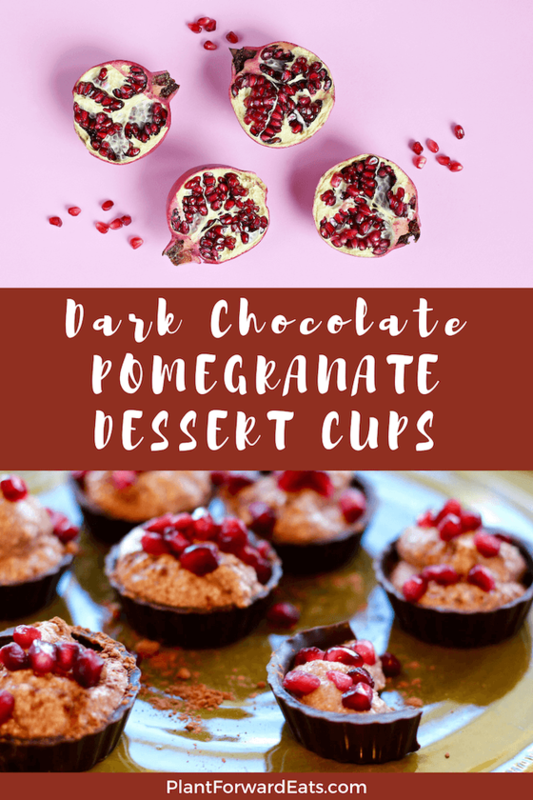 Soon enough, I created these Pomegranate Crunch Dark Chocolate Ricotta Cups. 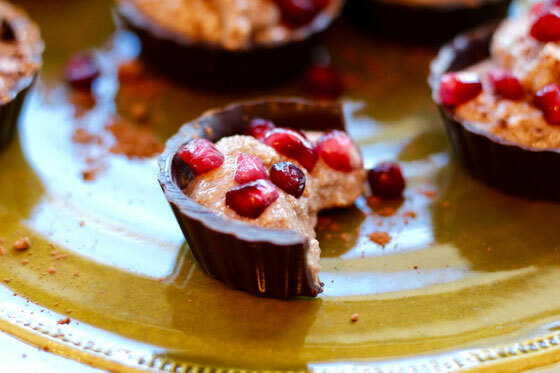 This mini dessert is perfect for your next holiday get-together. It's delicious and bite-sized, but the best part is it contains minimal added sugar. The ricotta is sweetened with unsweetened cocoa powder, vanilla extract, and just a touch of honey. In a small bowl, combine ricotta with vanilla extract, 1/2 Tbsp. cocoa powder, and honey. Place in a piping bag (or in a zip-top bag, with the bottom corner cut off). 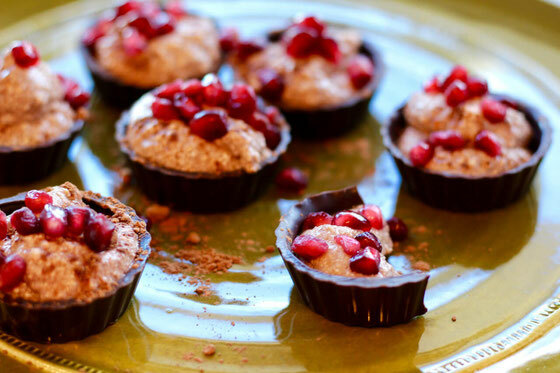 Fill each cup with ricotta mixture, then top with pomegranate arils and remaining cocoa powder. Serves 8. What are your thoughts on this topic? What are your favorite ways to cook with chocolate? What are your go-to mini desserts?